If you’re new to riding off road we want your experience to make you feel like a natural on the trail. We applied this idea into every facet of the newly designed Eva 27.5 models. From the geometry to the components the Eva 5.5 is ready for your next adventure. A woman designer created the Eva graphics, and colors were selected with help from our female feedback panel. Today, the Eva Line represents a new level of women’s critique, influence, and enthusiasm for the Raleigh brand. All Eva models have new women-specific frames with women tailored sizing. The 27.5" wheel size rolls faster and easier over obstacles on the trail than the 26” wheels, and offers a more optimized fit than a typical 29er. 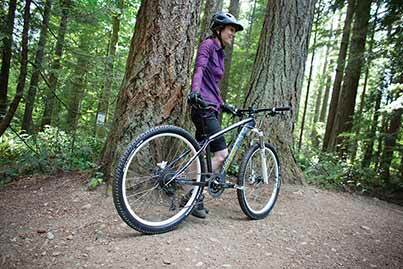 The fit of the bikes inspires confidence with uncompromising trail agility. Size specific bar width's and stem length's for optimized fit.